Am I too old to have an invisible friend? I slept in - didn't get up until just before eight. Made a pot of tea, some sandwiches with cheese and cucumber, found my book. Been stretched out on the sofa, reading and drinking tea, for some two hours - I should do this more often. And now that I realised what a wonderful idea it is, I will go back to do just that. The week of little sleep is here. Or rather, 9-10 days (usually). I have so far today done laundry, cleaned up after yesterdays cooking, cooked lunch for today and made a lunchbox for the week to come while I was at it, cleaned up after that, covered a canvas in paint (though it is far from finished), read for an hour, drunk four cups of tea (and two of them de-caf, before you ask), and cooked and filled another five lunchboxes. Although I just got five hours of sleep, I feel strangely active and awake. Must be spring approaching, don't you think? 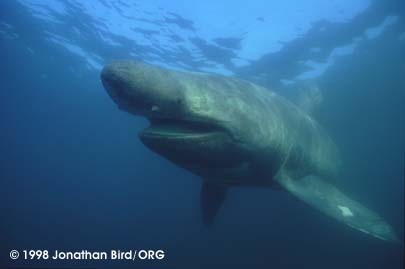 I found a picture of a happy-looking basking shark. One year has passed. One year of living here. It's been a great year! And Linus for being an endless source of good company and entertainment.